I am committed to providing my sons with a safe, faith-filled learning environment in our home. A large part of that mission is to read to them daily. By reading enriching stories I help nourish their curiosity and enhance their knowledge of the world. I am constantly on the lookout for new books to add to our story times. 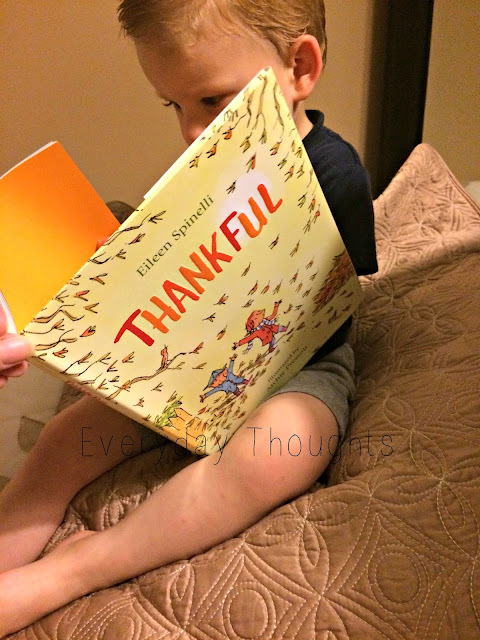 One of our favorite new bedtime books is Thankful by Eileen Spinelli. It's a poetic children's book with whimsical illustrations. The purpose of the story is to make children aware that there's always something for which they can be thankful and it teaches them to find joy in life's day-to-day. It's a simple, rhythmic tale that continually reinforces its message so that toddlers and young children can begin to learn from it. Thanksgiving is right around the corner and I want to start teaching my sons the true meaning of the holiday and I am using this book as a tool to help me do just that. The message is clear and concise so I don't have to worry about confusing my little ones. I do wish that there was more of an underlying theme of faith but God's Word is mentioned once and the concept of thankfulness is something that is well rooted in Scripture. The illustrations directly support the text and they keep things entertaining and fun for my toddler. As a mom, as a reader, as a women trying to teach faithfulness and thankfulness to others, I would recommend this book. What are some of your favorite bedtime stories for toddlers and young children? BookLook Bloggers provided me with a complimentary copy of this book for an honest review. I was not compensated for this review and all opinions are my own. I'm the exact same! I have to believe that when you're taught to live reading as a youngster that it carries over into adulthood! Have a great weekend! I love children's books! Especially when they are on something so important as thankfulness! I will have to look into this for my son. He loves to read! It's a great book with a great message. I also love the extra cuddles I get during story time! Those special moments cuddling and reading with my little a are some of my favorites! Reading to your children is sooooo important! And not just when they are small and can't read themselves. Kids love to listen at any age. Absolutely! If you start reading to them young they learn to appreciate the value of books from an early age. What a sweet memory and something special you'll be able to share and pass onto your own little sister in the future! I think reading to your kids is so important. My daughter now reads to herself mostly but I get to occasionally. I know my littlest will grow up, faster than I want them to, and read on their own soon too so I'm trying to cherish these special story times together. Aww this sounds like such a sweet book for littles! It's hard to find ways to talk about being thankful, so this is a great tool for that! 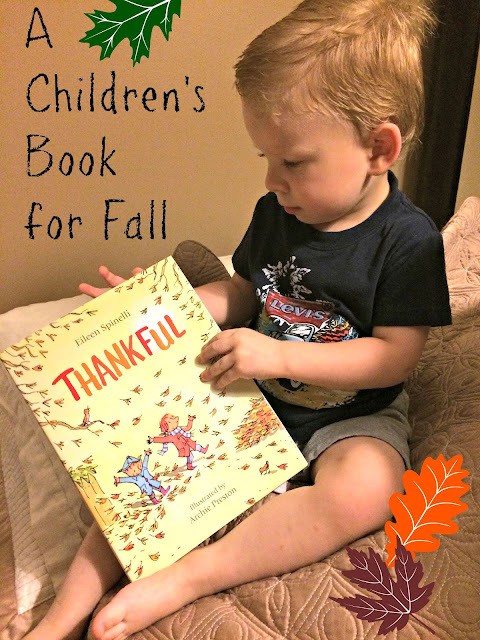 My oldest is only two so understanding what thankfulness means is still difficult but this book at least allows us to start that discussion. Yea! I hope you guys like it! This looks like a darling book! We are HUGE readers around here! I love to hear that children are still enjoying books in our highly digital world it's nice that bound books are still a favorite of children everywhere! This is so cute! I'll have to pass the title along to my sister for my nephew!